Extremely rare, the tiny African black-footed cat is one of the best hunters in the animal kingdom. Africa’s black-footed cat ranges in weight from only 2.2 to 5.5 pounds. 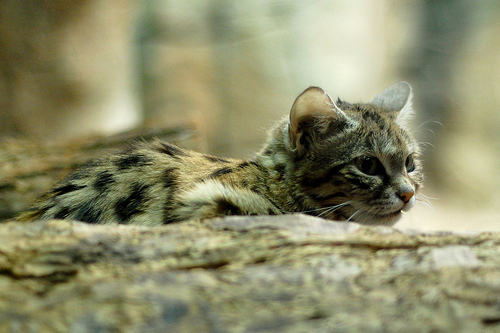 Often less than 2 feet long with a shoulder height of 6.7 to 10 inches, the wild black-footed cat is smaller than the majority of domestic cats. Felis nigripes has a face much like a domestic cat, but larger ears and a relatively short tail. Its fur is tawny and sleek, with black rings around the legs and tail, and spots on the body that act as night-time camouflage when the cat is hunting. By day, black-footed cats spend their time in hollowed-out termite mounds or other animal burrows. Black-footed cats live up to 13 years in the wild, and usually have 2 kittens per litter, often in November or December. The black-footed cat hunts a wide variety of prey, including rodents, rabbits, birds, large insects, scorpions, spiders, geckos and snakes. Black-footed cats can take down prey far larger than they are and capture birds in midflight, jumping as high as 4 feet in the air and 6 feet forward. A consummate hunter, the average black-footed cat captures a prey animal approximately every 50 minutes. The African black-footed cat is a threatened species due to habitat degradation (caused primarily by overgrazing of livestock) and poison left out by farmers to eliminate predators. Fewer than 10,000 adults remain in the wild, with an additional 40 in captivity worldwide, 19 of which are in North America. Most black-footed cats do not do well in captivity. The majority die from kidney failure, likely as a result of dietary problems. They are also vulnerable to respiratory diseases in humid areas and cannot tolerate cold weather. To learn more about wild cats, see Wild Cats of Canada, the Endangered Scottish Wildcat and Why Tigers Are Endangered.